The compact, versatile and durable Power Bench can be adjusted for incline or decline bench pull exercises, bench press or any supine or prone exercises and can be easily stored on the rear of the rack. 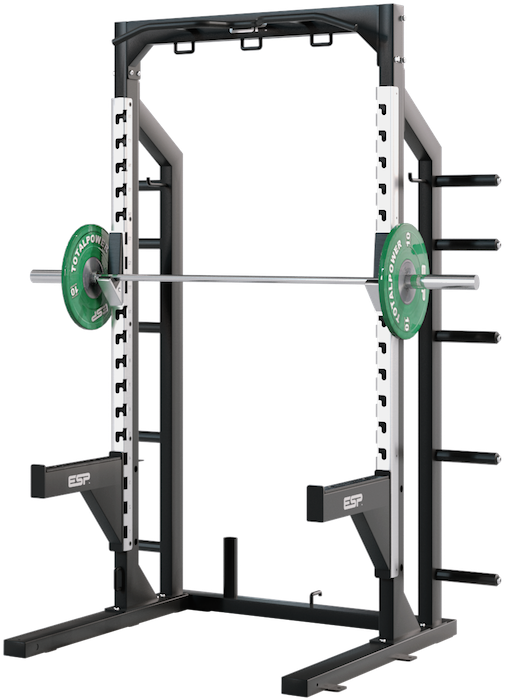 The barbell pivot with stainless steel pivot sleeve and heavy gauge steel construction is fitted to the base frame of the Power Rack and enables a greater variety of functional multi-plane whole body exercises to be performed on the TotalPower Rack. 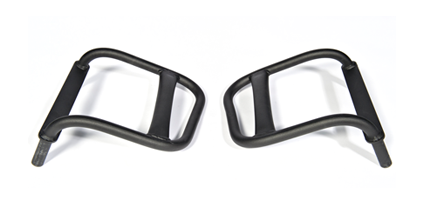 The dip handles offer dual thick and thin as well as wide and narrow grip options. The bars fit neatly into the safety spot-bars for variable height adjustment and can be stored neatly on the rear of the TotalPower Rack. 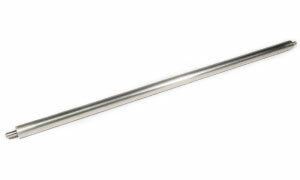 The sit-smooth, light weight, robust, drop-in bar hook with 3D machined nylon barbell profile and stainless steel frame are easy to adjust and come with a lifetime warranty. 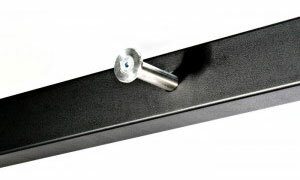 Up to three sets http://ordertramadol.org of bar hooks can be used on the front, inside and rear of the rack. 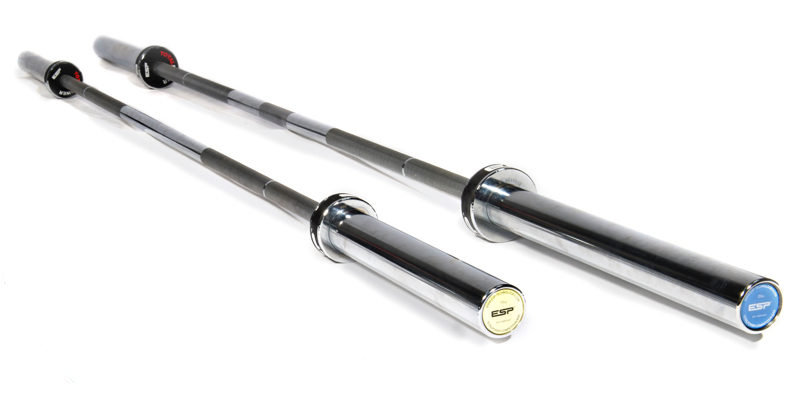 Excellent for band resistance training and rehabilitation, the multiple lower band pegs made from heavy gauge steel allow for varied band positioning or tensioning and the stainless steel adjustable top band pegs can be adjusted for bands fitted inside and outside of the TotalPower Rack. The wide grip utility bar can be positioned in any bar hook location for bodyweight exercises, such as supine rows, horizontal bar dips and graded pushups and is ideal for wheelchair pull-ups. The 20 disc weight storage toast rack is designed to keep the training area organised by incorporating one-size-only storage positions within the rack where each weight size only fits a specific holder. Space is provided for small discs and spring clamps. The 5-pair nylon easy-slide Olympic disc weight storage can accommodate all Olympic disc sizes and provides sufficient storage for performance training. 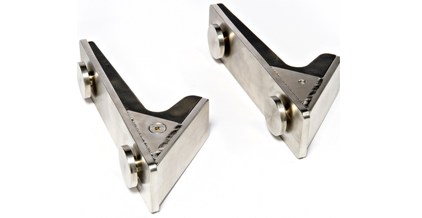 Included are storage pegs for bar clamps, chains and bands to maintain a clear and tidy training environment. 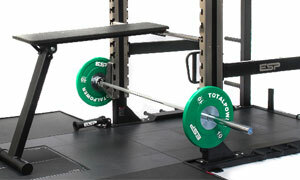 The ESP Power Rack is the global leader for elite sports performance training. Constructed from heavy duty box section steel with reinforced gussets in every corner and powder coated in a scratch resistant leatherette matt black finish. 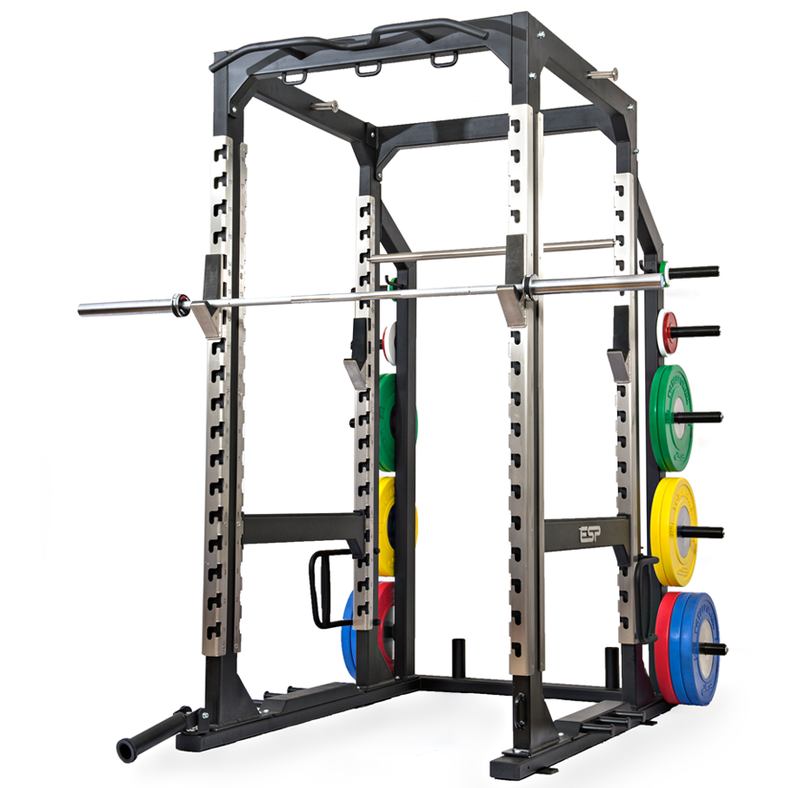 The Power Rack provides unrivalled functionality, robustness and aesthetics. The 4mm heavy duty stainless steel upright channels, both inside and outside the rack, provide support to the light weight (3kg) sit-smooth bar hooks with UHMW Nylon inserts and an unrivalled lifetime year warranty. Optional Accessories include; Bar Hooks, Weight Storage, Barbell Pivot, Band attachments (upper and lower), Dip Handles, Utility Bar. 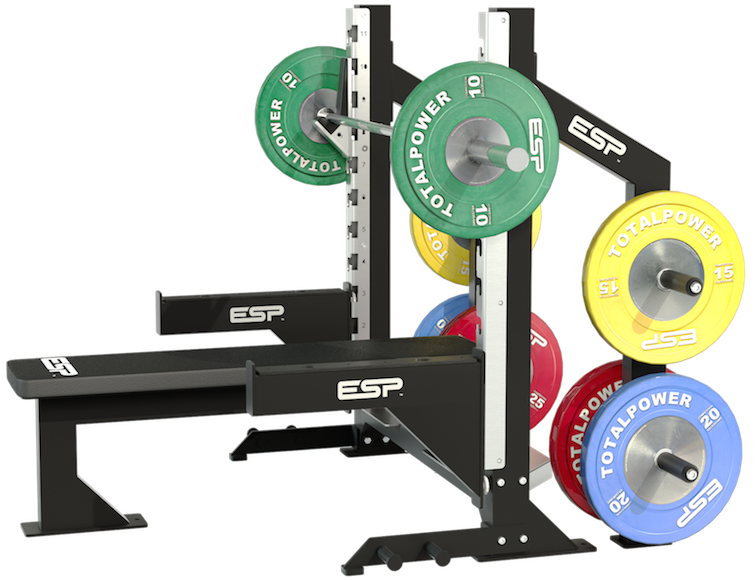 The ESP Half Rack is the ultimate compact training station for smaller facilities or where space is limited. The rack features stainless steel upright channels and lifetime guaranty sit-smooth bar hooks with integrated 10-peg weight storage, pull-up bars and attachable compact safety-spot bars. Additional accessories include an adjustable utility bar, Power Bench (prone row) and dip handles that fit into the safety-spot bars and stored on the rack when not in use. 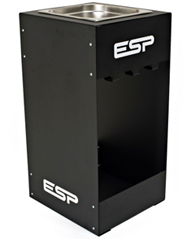 The ESP Utility Stand is a versatile, functional and robust training station for a wide variety of exercises. 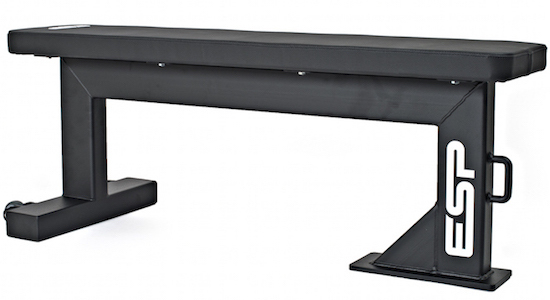 With a unique variable bar hook adjustment system, the Stand can be used as a universal bench stand for all pressing exercises using an adjustable bench at varying degrees. Alternatively, remove the bench to use as a squat stand or for other standing exercises. The Utility Stand includes ESP bar hooks and an integrated weight storage with the option to add Safety Bars for heavy lifting. 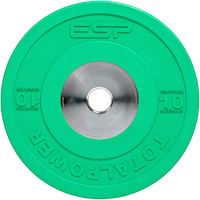 ESP are proud to provide the world’s most advanced Lifting Platform developed by world class experts. The intelligence and understanding of the requirements of weight lifting and impact acoustics and comprehensive testing carried out at Loughborough University, has led to the development of an unrivalled lifting platform, The TOTALPOWER™ Lifting Platform by ESP. The weight drop areas consist of 5 different layers of materials including a robust protective layer, an energy absorbing layer, an acoustic layer, an energy dissipating layer and an energy transfer layer which ensures reduced noise and rebound of dropped weights and greater protection to the subfloor. 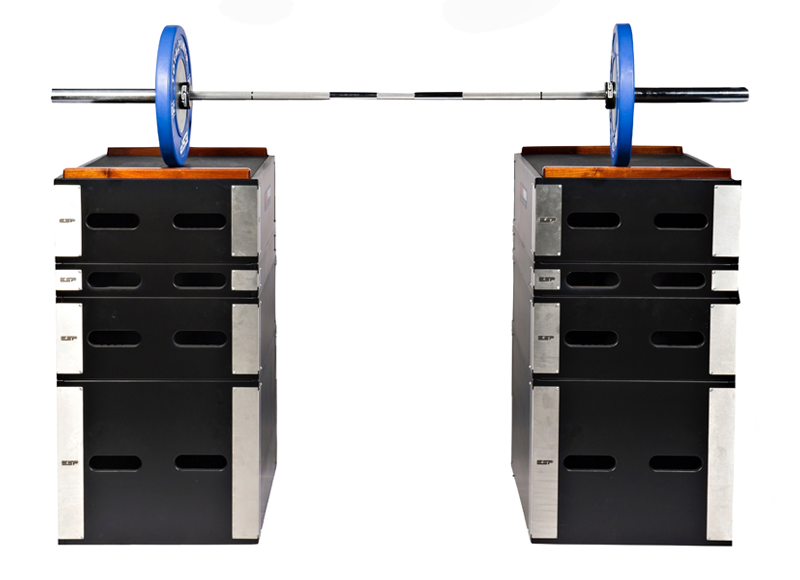 Independent testing at the Sports Technology Institute by Progressive Technologies Ltd demonstrated large differences in force reduction between different lifting platforms. 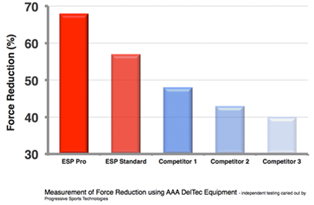 The graph illustrates that the ESP Pro Platform reduced force by 68%; displaying a 28% difference in force reduction between the ESP Pro and Competitor 3. 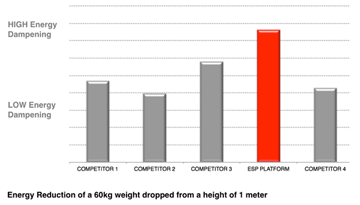 The ESP Pro Lifting Platform has 25% greater energy reduction when a 60kg weight is dropped from a height of 1 metre when compared to 4 platforms from UK competitors. 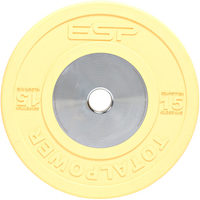 ESP’s high energy dampening properties, both vibration and noise is reduced by up to 25% in comparison to the other lifting platforms on the market. 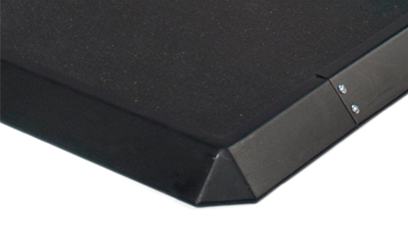 Heavy duty reinforced steel surround frame with tapered edges. The anti-slip rough grip PVC centre section is rigid and durable and can be branded with your customised logo, whilst the centre section is high density optimum coefficient of friction PVC and available in a selection of contemporary colours. 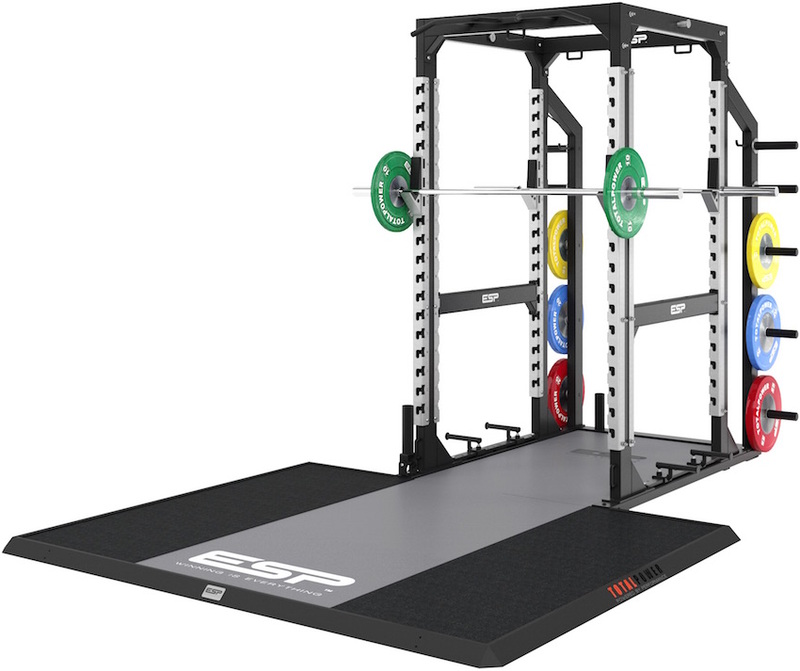 ESP Lifting Platform Combo is a seamless integration of the global leading ESP TOTALPOWER™ Rack and Platform. It has been designed to allow for lifting, inside and outside of the rack. 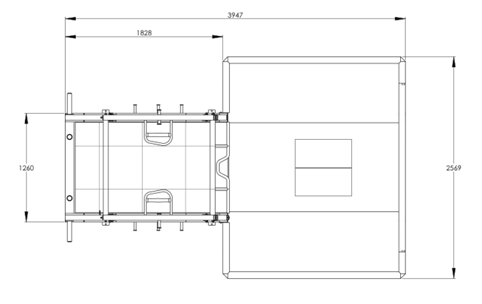 The full length lifting area increases training options, usage capacity and safety. The Lifting Platform can also be flush fitted with the surrounding floor. The centre section is a high density optimum coefficient of friction moulded PVC and available in a selection of contemporary colours. 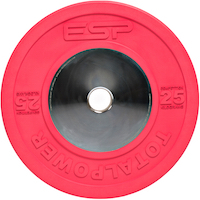 ESP IWF Compliant TOTALPOWER™ Weights are precision made for high performance Olympic lifting, calibrated and tested to International Weightlifting Federation standards. The Weights are coloured according to IWF specifications, manufactured from the highest quality one piece moulded rubber and precision machined one piece centre steel hub. ESP IWF Compliant TOTALPOWER™ Competition Bars are precision built for high performance lifting and are calibrated and tested to maximal standards. Manufactured from the highest quality pure steel, the Competition Bars are tested for a bend force of 1500kg (calibrated and tested to 225,000 PSI tensile strength). The TOTALPOWER™ Bars include full needle bearing sleeve mechanism for friction free rotation; optimal knurling for competition lifting with light low friction knurling in the centre of the bar, and finished in ESP hard chrome for a lifetime of lifting. 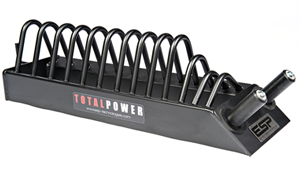 ESP TOTALPOWER™ Competition Bars carry a lifetime warranty on manufacture defects. Drop only on rubberised Weight Lifting Platforms. Use only with rubberised Bumper Plates. Not to be left with weights loaded when not in use. For indoor use only. Excludes normal wear and tear. 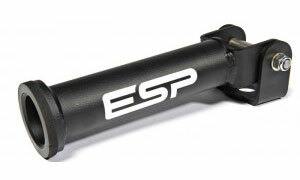 The ESP PRO Dumbbells are made to last. Only the best quality high tensile steel is used and the dumbbells are machined from one solid piece of steel to ensure unrivalled durability. The custom knurling on the handles provides a balanced texture that is sturdy and comfortable to grip. 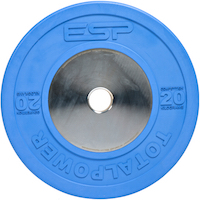 Every ESP Dumbbell has a Lifetime warranty and is available from 2kg up to 80kg. Available in standard and thick grip variations. 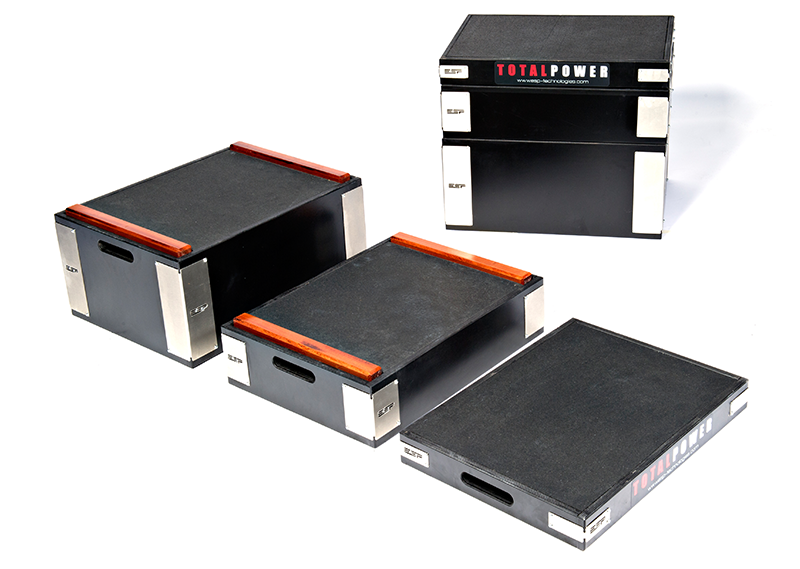 Consisting of three stackable layer pairs, the versatile Training Blocks (Technique Boxes) feature reinforced stainless steel corners, double reinforced internal battens and have been designed for multipurpose uses including Olympic lifting, technique training, step ups, box squats, plyometric training and much more. The set of 3 sizes of boxes are durable and designed to cater for high drop loads. The heavy duty reinforced wooden Power Blocks (Jerk Boxes) are constructed from the best grade birch plywood with stainless steel reinforced corners. Each set comprises of four stackable layers (500mm, 250mm, 125mm, 250mm) and is capable of handling high loads dropped from overhead. 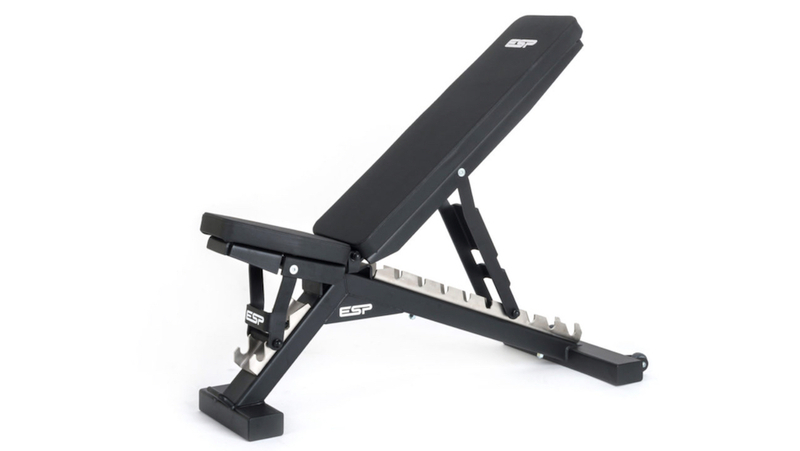 The high performance ESP Adjustable Bench provides durability and stability for all users. Built with a heavy duty steel frame and finished in chip resistant matte black, the bench balances performance with a slick design. With 9 backseat positions, and 3 seat angles, the bench can be adjusted to varying incline positions from zero degrees to 85 degrees. The integrated grab handle and wheels allow for effortless transportation while the high comfort memory foam seat provides comfort while training. The Bench Press is a heavy duty Elite High Performance training station with unrivalled functionality, durability and aesthetics. The heavy duty stainless steel upright channels provide for variable bar hook adjustment with and lifetime guaranteed sit-smooth bar hooks. Features include, a spotter step, a high comfort memory foam seat, positional floor fixings, and optional accessories including weight storage, band attachments and safety bars that can be integrated into the modular design. 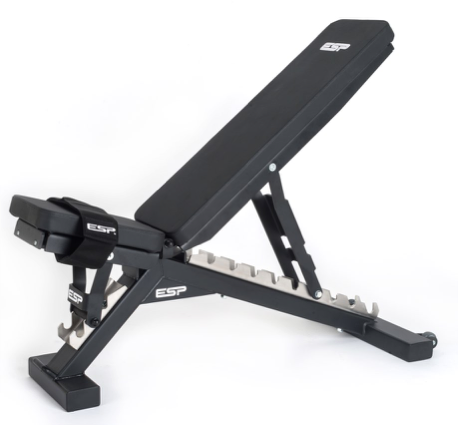 The ESP Flat Bench is designed for heavy duty training and features compact wheels and a grab handle for easy manoeuvring, and durable memory foam seats for comfort and stability when training. 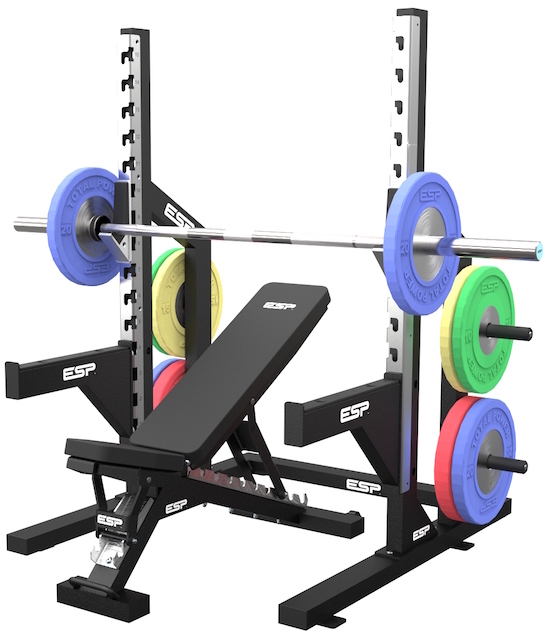 The bench can be used for a variety of exercises and can be used inside the ESP Power Rack to form the ultimate training station. The IPC compliant Paralympic Bench Press is a heavy duty Performance training station for Paralympic Powerlifting. Designed for functionality and durability, the heavy duty stainless steel upright channels provide variable bar hook adjustment with lifetime guaranteed sit-smooth bar hooks. The bench also features a spotter step, personalised moulded memory foam seat and strapping bars for support . Optional accessories include weight storage, multiple band attachment positions and safety bars. 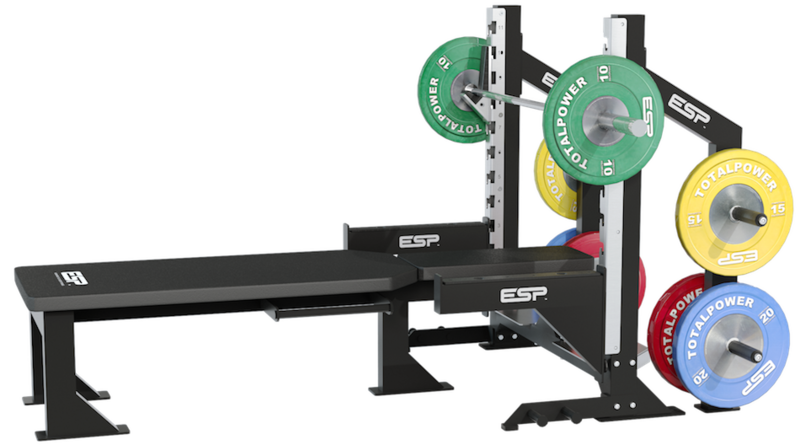 The ESP Inclusive Adjustable Bench has been built specifically for any athlete requiring additional support while training. The wide seat with heavy duty velcro support strap has been designed to create a comfortable and stable training experience. A durable and stable bench ideal for lower limb disability, amputees, balance and neural disorders.